My daughter and I both suffer from eczema and I have tried many different products over the years in an attempt to find relief. Unfortunately, many didn’t work and some even caused the condition to become worse with use. We recently tried several products from the TrueLipids® line and I am thrilled that it has made a real difference for both of us. 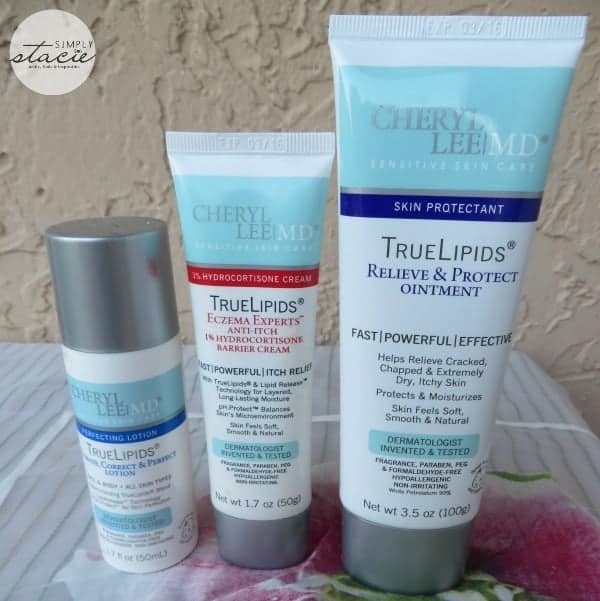 TrueLipids® was created by Cheryl Lee D. Eberting MD who is a board certified dermatologist and clinical researcher. She developed this line of therapeutic products to help the many people who are suffering from Atopic Dermatitis, eczema, rosacea, psoriasis, diaper rash, severely chapped lips and more. What makes TrueLipids® different from other brands that I have tried in the past is that it provides continued relief from the dryness, itching and discomfort that we experience during eczema flare-ups. In fact, for virtually the first time ever my daughter is not digging at the skin around her ankles and feet due to the horrific itching. You can almost hear her sighing with relief when I apply the products to her trouble areas. I also appreciate that there are no toxic ingredients in any of the moisturizers and it is hypoallergenic so I feel confident that it is safe to use on her fragile skin. TrueLipids® Eczema Experts Anti-Itch 1% Hydrocortisone Barrier Cream (SRP $49.99) works so quickly to relieve itching. Hannah’s dry, scaly skin almost immediately feels softer and this ointment provides a barrier from chemical irritants, allergens and barriers. In addition to the hydrocortisone it also contains natural, anti-inflammatory extract from licorice root which I found interesting. I personally use this on my hands and fingers where I have eczema flare-ups from a reaction to soap and hand sanitizers. I also have started to be able to wear my wedding rings again by simply applying a tiny amount of this product to the affected skin before putting my jewelry on…..my husband and I are delighted that I can finally wear my wedding set again! The skin protectant, TrueLipids® Relieve & Protect Ointment (SRP $49.99) protects and moisturizes the driest, cracked skin. Hannah’s feet actually develop open, deep cracks which are extremely painful and I am always worried about the possibility of infection. We apply a small amount of product to her feet every night and then she puts on a pair of light cotton socks. After one week, Hannah shouted with joy, “Mama….look at my feet, there are NO cracks!” I prefer to use naturally based products so I was pleased to learn that this product works with no parabens, no formaldehyde and no fragrance. This product in particular works better than any other eczema brand that I have ever tried in the past…..and I have tried A LOT of creams and ointments! TrueLipids® Hydrate, Correct & Perfect Lotion (SRP $49.99) is a wonderful product for the face and body and can be used by all skin types as it is hypoallergenic for even the most sensitive skin. I use this on the dry patches of skin on my cheeks and behind Hannah’s ears. I find that this soothing lotion absorbs almost instantly and has no greasy residue which I really like. While TrueLipids® may be priced higher than other skin ointments and creams, I want to mention that if you are suffering from unresolved skin conditions then this would be a wonderful option. In terms of price, I have spent a ton of money on products that did not work so in fact this would have actually saved me money if I tried it from the start. Also, a small amount of product provides us with long lasting relief so in my opinion these products are a good investment. Finally, seeing my daughter’s painful cracks healing is priceless! You are invited to visit CherylLeeMD to find the correct products for your particular skin ailments and be sure to check out the Before/After photos! Connect with CherylLeeMD on Facebook, Twitter and Pinterest. I love the variety of products and how well they work. My husband’s hands constantly are breaking out, and my daughter has atopic dermatitis. I really like that you can use some of them on your face, too. The idea of a product like this for chapped lips is great. I just wish it was cheaper. My husband is a believer in if a little works a lot will work better. We go through lotions and creams left and right. Always trying and buying new. I’m glad you found something to work for you and your daughter. This sounds like it has some nice ingredients for many things. Thanks for sharing. I think my husband would like this for his dry skin. It sounds great. He is always using some sort of cortisone. These products sound wonderfully hydrating and soothing,. I’d love to give them a try. I think the product that I would most like to try is the lip balm. Thank you for sharing this review. I would love to get some of these products for my brother, he has a lot of trouble with eczema and nothing seems to work for him.